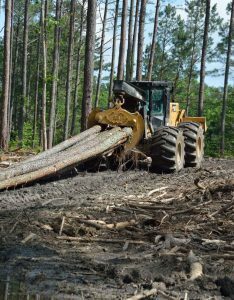 On land where his grandfather harvested tobacco decades earlier, Jimmy Williams worked a feller buncher to select cut a mix of pine and hardwoods on 71 acres now owned by the Army Corps of Engineers near Jordan Lake in Chatham County, North Carolina. At another jobsite, not far away, logging equipment was being set up for J.M. Williams Timber Company’s next job. To keep his crew working consistently, Williams typically sets up equipment at two jobsites simultaneously. That way, when work is completed at a job his crew can move to a new site without losing a day’s work. Williams runs Cat® machines almost exclusively. 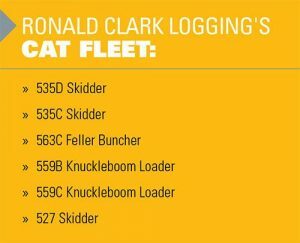 His Cat fleet includes: a 535D Skidder, 535C Skidder, 563C Feller Buncher, 559B Knuckleboom Loader, and a 559C Knuckleboom Loader. 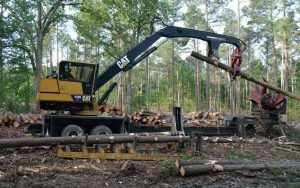 An 18-year-old 527 Track Skidder with a six-way blade is used for construction of roads and landings and clean-up work. The tracked machine pulls drags out of the woods when mud makes sites inaccessible to other machines. “The ground pressure is four pounds per square inch. That’s less than a 200-pound man with a size 12 boot,” Williams says. Williams works primarily in North Carolina’s Piedmont Region, generally no more than 50 miles from company headquarters in Apex. Cat machines meet the challenge of working in soil conditions in the region that range from clay to thick top soil. The 563C Feller Buncher runs on 44-inch tires to work in soft soil. “Some guys run dual tires, but I do select harvest so I can’t be 14-feet wide. I have to stay narrow,” Williams says. The work is on a contract with a mill, as is 90 percent of Williams’ business. “I might do ten percent for people that want to work directly with me,” Williams says. Trucks are lighter, by as much as 6,000 pounds compared to those he ran previously. “I can’t make it up on volume, so I try to make every load count,” Williams notes. And the legacy of harvesting the bounty of the Piedmont Region, handed down from father to son for three generations, continues.